Meet the Eye of Horus. It’s a newly discovered galaxy system that’s hiding something incredible in those fuzzy swirls of light circling it: a way of looking back into even further and older galaxies. The new galaxy system was discovered by the National Astronomical Observatory of Japan using the Subaru Telescope over the course of a massive survey that it’s been conducting of deep space. 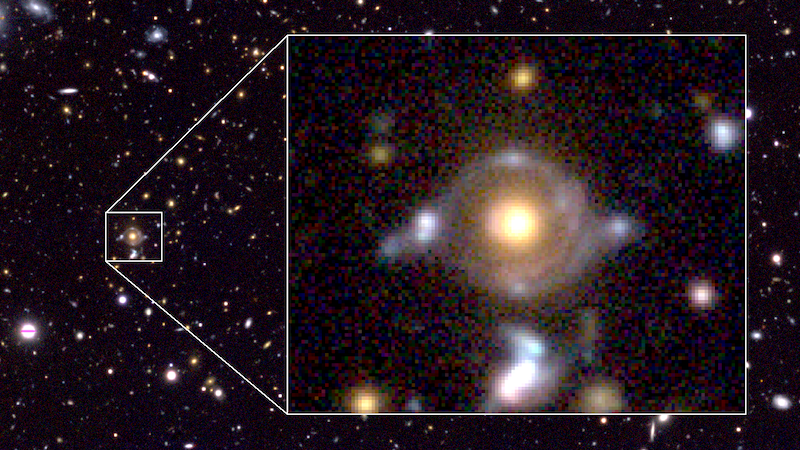 During a session for student astronomers, the galaxy was flagged for its unusual appearance. In addition to the galaxy you can see right in the center of the above image, there are actually multiple galaxies behind that appear as swirling lights you see around the main galaxy’s center. That we can see the more distant galaxies at all is due to gravitational lensing. It’s the same phenomenon responsible for letting us see those images of galaxy clusters in deep space through the Hubble telescope. The strong gravity of multiple galaxy clusters makes the space around them bend, which means the light around them also bends. This creates a “zoom lens” into space which we can combine with the power of telescopes like the Hubble to see incredibly deep and far into space. The end result of this effect is that both galaxies—one 10.5 billion light years away and the other 9 billion light years away—are reflected in different rings. Although many galaxies can reflect a single galaxy behind it, the Eye of Horus’ ability to reflect multiple galaxies is rare. Researchers at NAOJ hope to find even more examples of this phenomenon as they continue the survey.